Milly* can keep herbs fresh for weeks. I was in charge of herbs on our last reef trip on ‘Taslander’, and no doubt will be again this year. Nobody could believe that they could last the distance. Because I have most herbs growing I tend to be lazy about storing them, but Milly is a marvel. First she washes them well, shakes them out to dry, then leaves them for an hour or so to dry completely. Then she places a double sheet of absorbent kitchen paper in the bottom of a plastic take-away container and adds the herbs. Even Milly can’t help with coriander, which is the most impossible of all herbs to store fresh. It is quite easy to grow, but has the annoying habit of going to seed as soon as it reaches maturity. If you want coriander on hand at all times, chop it finely, and pack it into ice block trays. Cover with water and freeze. 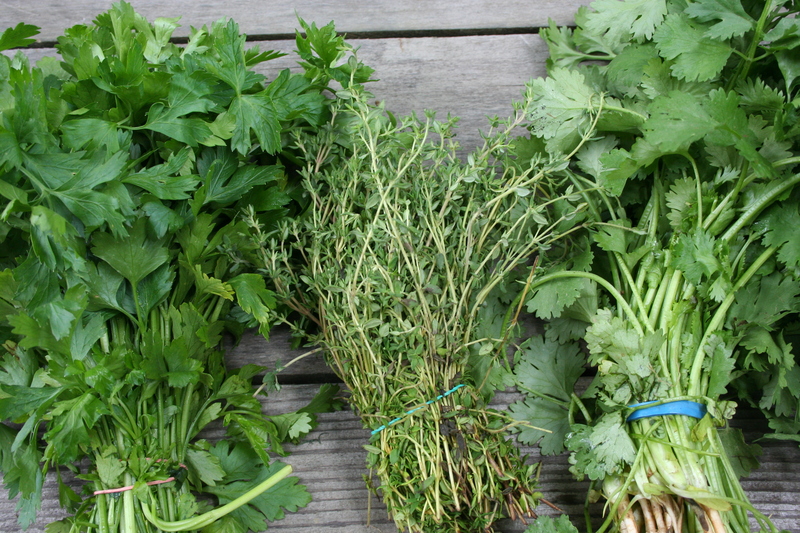 When frozen, remove the blocks of frozen coriander from the ice block trays, place in plastic bags and seal. The ice-blocks will keep indefinitely in the freezer. Kaffir lime leaves, called ‘makrut’ in Thailand, are the peculiar double leaves of the Thai lime tree. They are available dried from any good Asian supermarket, but if you are lucky enough to have some friends (like Bob and Anne Douglass) with a kaffir lime tree, ask them if they could spare some leaves and simply freeze them in zip-up plastic bags. A lot of people seem to think that dill and fennel are the same plant. They are not, although both have the same feathery tops and both have the same slightly aniseed taste. If planted together they will cross-fertilise and you will end up with either all dill or all fennel. I can’t remember which. If you don’t believe me, dill is Anethum graveolens, fennel is Foeniculum vulgare dulce. Why two such unrelated plants are able to cross-pollinate is beyond me. Fennel has a swollen bulb-like base, which tastes of aniseed; it is sometimes sold as ‘aniseed’ rather than fennel. Greek basil is not the same as sweet basil. Greek basil is a perennial plant that will grow easily from a cutting. Sweet basil is used extensively in Thai and Vietnamese cooking. It has a larger leaf than Greek basil and is an annual, not a perennial, and can only be grown from seed. Never use Greek basil in Thai or Vietnamese cooking.